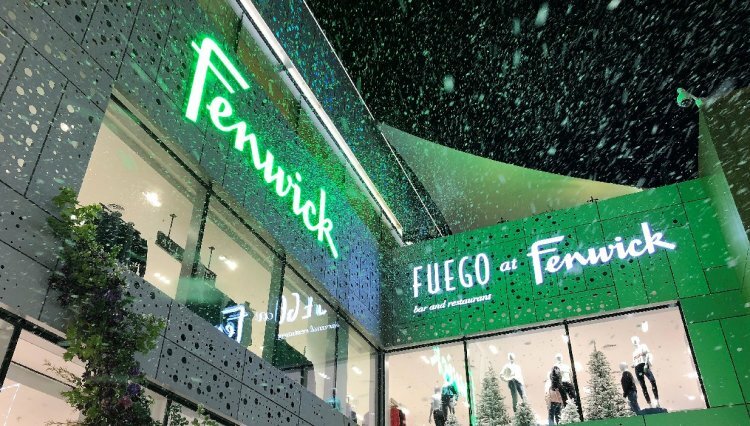 Following the success of our snow machines at last year’s Christmas Warm Up shopping event at Fenwick Bond Street, Confetti Magic were invited back to add to the festive cheer at London, Bracknell, Canterbury and Colchester this year. Running over two days, the event offered shoppers big discounts to start their Christmas shopping early, with drummers, ballerinas, walking Christmas trees and even a visit from the man himself, Father Christmas, to welcome people in-store. Our snow machines were set to run during the lunchtime period and then throughout the evening, creating beautiful flurries of snow around the entrance. As kids posed with stilt walking fairies, they said ‘watch, we can make it snow’ and with a wave of their wands, the air was filled with magical snowflakes to the delight children and adults alike. The snow machines use a specially formulated fluid to create a storm of tiny foam flakes that float and swirl in the air just like the real thing. With three sizes of snow machine available to hire and tanks up to 200 litres, we can create a flurry or a blizzard for as long as is required. When falling onto pavements or grass, the foam doesn’t create a slip hazard and as you would expect, it is tested to be safe to fire over people and fully biodegradable. With Christmas fast approaching, our snow machines are busy at Christmas Lights Switch-ons, parties, festivals and promotions, guaranteeing a white Christmas wherever they go.